How to Develop a Strategic Business Growth Plan – Sparks Law Office, P.C. I regularly remind small business owners of this harsh reality. Many small business owners strive to grow their business to the point of comfortable profitability, and then they press the pause button. They ignore deliberate sustainable growth. They do not take the time and effort to put together a strategic growth plan. What do you provide to your customers each and every time that others don’t? How is this niche and service relevant and credible? What value does it bring to the customer? Business owners are often encouraged to have a 30-second elevator speech that explains to customers the benefits of doing business with them. Focus on what sets you apart from the competition and stick to this value proposition. No matter your industry, your competition is likely excelling at something with which your company is struggling. Look toward similar businesses that are growing in new, unique ways to inform your growth strategy. Don’t be afraid to ask for advice! As a small business owner just starting a business, you may have many customers, only a portion of whom are your ideal customers. 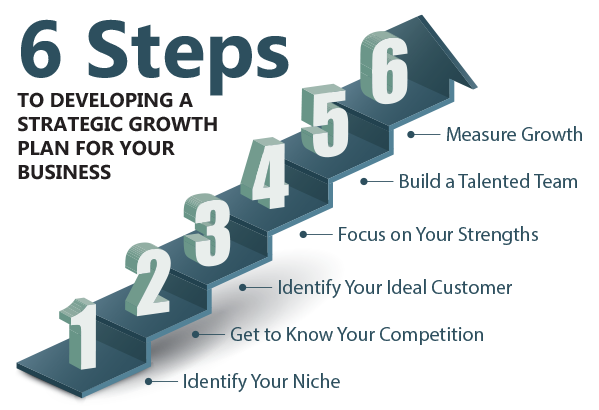 In order to stimulate your business growth, you should be able to identify your ideal customer and focus on that audience as you adjust your business goals and services. Sometimes, focusing on your strengths — rather than trying to improve your weaknesses — can help you establish growth strategies. Reorient the playing field to suit your strengths, and build upon them to grow your business. Your employees have direct contact with your customers, so you need to hire people who are motivated and inspired by your company’s value proposition. There are many ways to invest in your team to motivate and encourage them. Remember, your employees are your biggest asset and your biggest liability. Minimize your risk by choosing your team wisely and investing in their future with the business. Can you measure your growth? Growth and your growth goals must be measurable. If you’re unable to measure your growth, you have no way of knowing whether your growth strategy is effective. Identify which key indicators affect the growth of your business (closing ration, quantity of sales, product A v. product B, profit margin), then dedicate time and money to those areas. Developing a growth strategy isn’t a one-size-fits-all process. Outside factors may require you to change your strategy mid-stream (i.e. changing market conditions). Remember that the goal of any strategic growth plan is to adopt a plan that helps you grow in your strengths and allows you to eliminate areas of weakness to attract and build relationships with your ideal customers. Employee Handbooks: What Federal Laws Should Be Included? Carol is a Small Business and Estate Planning attorney serving the St. Louis Metro-area, in both Illinois and Missouri. Visit our website for more info.